The market spent the day consolidating the prior trend day down out of a coiled chart formation. 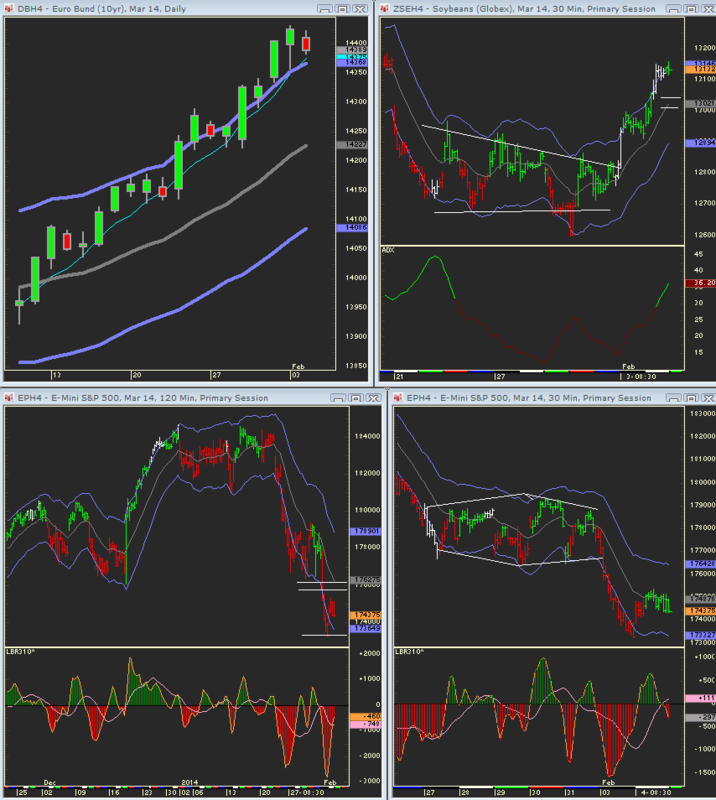 Indexes were able to retrace to the 30 minute EMA where resistance came in. Many markets have “three bar triangle” formations going into Wednesday. This often can be a compelling breakout formation. However, the market often stays in another contained range the day before FOMC. The SPs may continue to fill out range on the 120 minue charts to consoldiate the damage done. Other markets with 3 bar triangles: Bonds EC GC SI HG CL… This simply meanas that Tuesday’s range had a lower high than the two day high and a higher low than the 2 day low. With this type of pattern, the 120 minute chart, along with its key swing high and low become the ideal time frame to watch during the next day’s trading. The short term summation tick chart is still deeply oversold. Other market timing indicators, such as breadth oscialltors and the 5 day moving average of the closing ticks are also oversold. However, the SPs can retest back down on the 120 minute charts since they found resistance at the 30 minute EMA. If they put in a higher low on the test down, they can then form an A B C type of consolidation into the 120 minute EMA. 1734 was Tuesday’s low. 1753.50 should continue to serve as resistance. Bonds and Bunds – a lower high on the 120 minute time frames will set up a shorting for a better flush down. The market may wait until after Thursday morning’s ECB before breakout out of its coil. Beans and corn have an upside trend intact. A morning reaction down to the intraday moving averages wil set up a grail buy. Wheat met its intitial upside objective and then some. 578 was a previous swing high so Wednesday will be an important day to see if it can close above this or not.